Explore Brisbane's surroundings by going to Scuba & Snorkeling (in Mooloolaba), David Fleay Wildlife Park (in West Burleigh) and Parrots in Paradise (in Glass House Mountains). Spend the 25th (Thu) observing fascinating marine mammals with a dolphin and whale watching tour. There's lots more to do: identify plant and animal life at Lone Pine Koala Sanctuary, get your game on at Psychic Readings Twin Featherz, take in nature's colorful creations at Roma Street Parkland, and explore the striking landscape of Burleigh Head National Park. To find where to stay, more things to do, and more tourist information, read our Brisbane vacation maker website . Luxembourg City, Luxembourg to Brisbane is an approximately 27-hour flight. You can also do a combination of train and flight. Traveling from Luxembourg City to Brisbane, you'll lose 9 hours due to the time zone difference. In April, Brisbane is warmer than Luxembourg City - with highs of 30°C and lows of 19°C. Finish your sightseeing early on the 26th (Fri) so you can travel to Airlie Beach. Spend the 27th (Sat) among aquatic life with a scuba or snorkeling tour. On the 28th (Sun), spend a thrilling day on the water with a speed boat tour. And it doesn't end there: get some thrills out on the water with a waterskiing or jet-skiing adventure, surround yourself with nature on a nature and wildlife tour, go for a walk through Bicentennial Walkway, and kick back and relax at Airlie Beach Lagoon. For photos, reviews, traveler tips, and other tourist information, refer to the Airlie Beach travel route planner. Do a combination of flight and bus from Brisbane to Airlie Beach in 5 hours. Alternatively, you can do a combination of flight and ferry; or drive. Expect a bit warmer evenings in Airlie Beach when traveling from Brisbane in April, with lows around 26°C. Wrap up your sightseeing on the 30th (Tue) to allow time to travel to Sydney. Spend the 4th (Sat) wandering through the wild on a nature and wildlife tour. 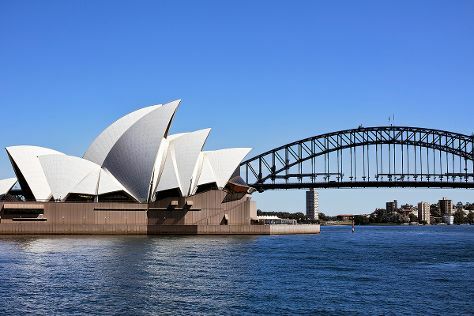 There's still lots to do: catch a live performance at Sydney Opera House, admire nature's wide array of creatures at Sea Life Sydney Aquarium, take in the views from Sydney Harbour Bridge, and admire the natural beauty at Royal Botanic Garden Sydney. For maps, where to stay, and more tourist information, you can read our Sydney road trip planning site . You can do a combination of bus and flight from Airlie Beach to Sydney in 6 hours. Other options are to do a combination of ferry and flight; or drive. Traveling from Airlie Beach in May, things will get slightly colder in Sydney: highs are around 24°C and lows about 14°C. Wrap up your sightseeing by early afternoon on the 8th (Wed) to allow enough time to travel back home.